After calculating the financing for a sale, you may want to "tweak" the payment amount, total of payments or the amount financed. The Adjust Pricing button on the right side of the Pricing tab when entering sales allows you to do this without performing any difficult manual calculations. ▪Select what you would like to change in order to achieve the desired amount (the APR, Price, Trade Allowance, Down Payment, or service contract). ▪After clicking Begin Adjustment, whatever you picked to change will automatically be modified to reach the desired amount. For example, let's assume you first enter a sale with a vehicle price of $2,300, an APR rate of 25.00%, a total cash price of $2,530 and a down-payment of $400, bringing the amount financed to $2,130. When you calculate the financing for twelve monthly payments, you get a payment amount of $202.44. In order to keep it simple and have the payment amount come to an even $200, you could open the Adjust Pricing window, enter $200 as the desired payment amount, and choose to modify the price. 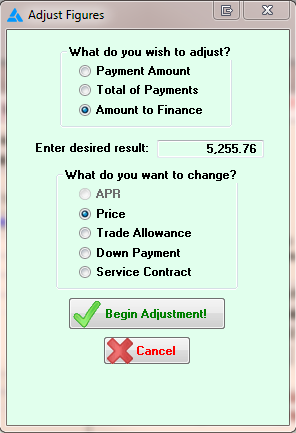 After the adjustment is complete the price comes to $2,275.55, and the payment amount sits at $200. On the other hand, let's assume you don't want to reduce the price by that much, but your customer is curious as to what down-payment will make his monthly payment an even $200. Then, you could open the Adjust Pricing window again and choose to change the customer's down-payment. It turns out the customer must make a down-payment of $425.67 in order to have a monthly payment amount of $200.